Most people have a soft spot for peanut butter & jelly sandwiches; the straightforward meal is a favorite of starving students and kindergartners alike. The humble PB&J even sustained the country through World War II. Housewives were urged to use peanuts in their meat grinders as an inexpensive, nourishing alternative to meat. There are a variety of ways to prepare this patriotic sandwich: crusts neatly cut off, grilled and ooey-gooey, or maybe with some sliced strawberries. But when was the last time you enjoyed one? If I’ve aroused your taste buds, there are a few places in Salt Lake City to indulge. Salt Lake’s finest PB&J hails from The Rose Establishment (235 S. 400 West, 801-990-6270, TheRoseEstb.com). 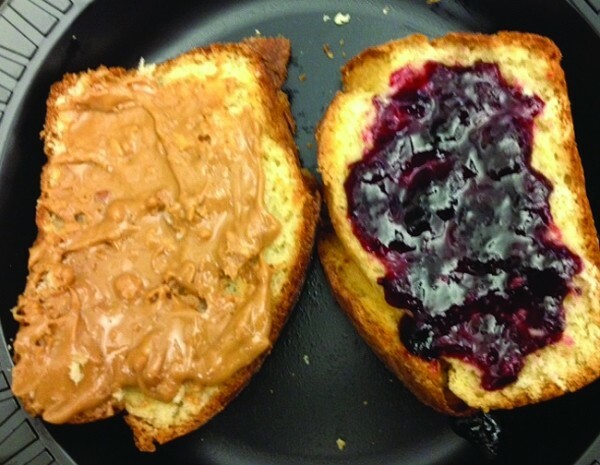 A layer of peanut butter and preserves between two thick slices of toasted bread from Eva’s Bakery is PB&J perfection. There’s nothing prefab about this sandwich: Both the peanut butter and the preserves are housemade. Paired with a latte, it’s a little heaven on earth. Salt Bistro at The Leonardo (209 E. 500 South, 801-890-3850, TheLeonardo.org) is a great spot for a quick nosh, offering small bites and a wine & beer menu. For the young at heart, try PBJ The Leo Way: housemade peanut butter and preserves with a layer of granola for a satisfying crunch. And to top it off, the sandwich is grilled. Order a glass of wine with your PB&J, and relish being an adult. If you’re more of a DIYer, there’s a world of PB&J possibilities. Pick up some local bread, your favorite peanut butter and chose from the huge variety of delicious locally made jams. My favorite is Black Mission Fig & Concord Grape jam from Amour Spreads (888-554-6845, AmourSpreads.com)—an elegant contribution to a modest sandwich. Revisiting this childhood favorite snack as an adult, you can probably understand why peanut butter & jelly sandwiches have nourished generations. Take your inner-child to lunch today and rediscover the PB&J.